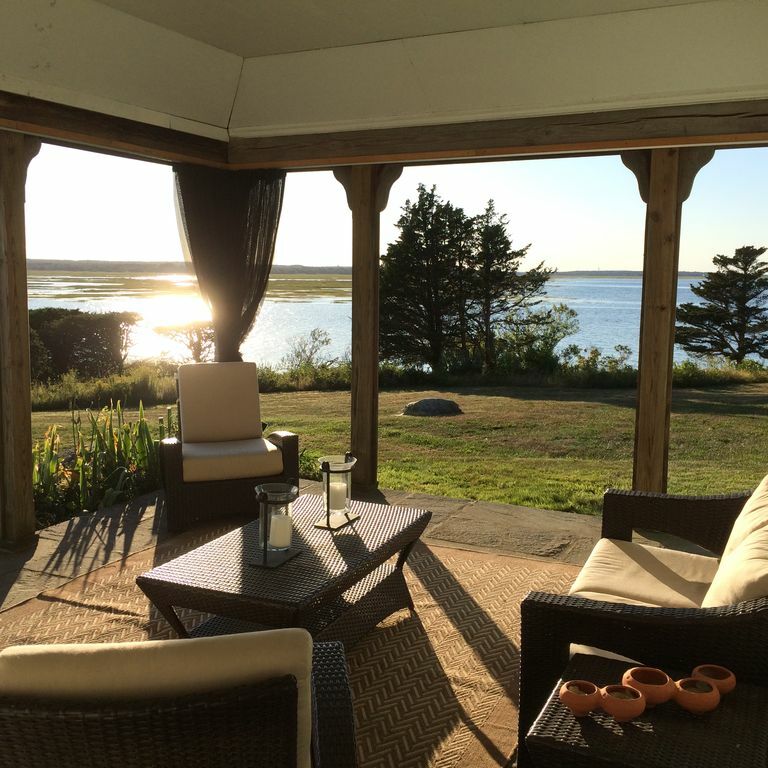 This private 5 acre waterfront property features breathtaking views of the Barnstable Harbor and the dunes of Sandy Neck. The property has its own little beach for wonderful high tide swimming, some of the Cape's best Striped Bass fishing and excellent clamming at low tide. After all that activity you'll appreciate the outdoor shower with amazing views. On the grounds to the home are a flagstone terrace, a new brick patio facing the water with stone walls and steps, and an outdoor lounging pavilion. The house features a beautiful kitchen and a large screen TV in the family room. This may be one of the most magnificent pieces of property on Cape Cod. You may never want to leave! 1 king, 4 twins (twin can be converted to a comfortable King), 1 double. This property is very special. It's set in a beautiful and peaceful location, with natural gardens and overlooking wonderful scenery. The house itself is very tastefully furnished to the highest standard, with all modern conveniences. The summer house, fire-pit and great wi-fi service were an added bonus! The owners, Lorrie and John, could not have been more helpful, friendly and accommodating. It's everything it says on the website and more...A real gem. Beautiful place, pictures online do not do justice. Well appointed house with spectacular views, family oriented in a small town with great feel. Nearby shops, great coffee, marina. My family had a wonderful week on the Cape in this home. The view of the saltwater marsh is gorgeous. The living room has been renovated to offer sweeping views of the landscape. We enjoyed swimming from the private beach, grilling on the deck, reading in the hammock, and relaxing in the outdoor areas. We did leave to visit the local attractions, but the house was really the best part of the experience. A total antidote to city life. We hope to return. This is a fantastic property. I have stayed with a group of friends ; this is out tenth year. We come to fish, the property is ideally located to fish the western part of the Cape. The best fishing is usually right off the back of the property. Direct kayak access to Barnstable Harbor, including Horseshoe Shoals and Bone Hill Flats. The home itself is simply wonderful. The owners keep the property in top notch shape and have made many improvements over the years. Its really a charming home with a great patio. The best thing is the view. No better place in Cape Cod to watch the sunset. Breathtaking! Almost too good to believe. Simply wonderful. This is a wonderful place. A group of friends stays at this property every year, this was our tenth year. We are fly fisherman, and the property is ideally located to fish almost anywhere on the west Cape. Direct kayak access to Barnstable Harbor. The best fishing is almost always right off the property. The house itself gets better each year. The owners are fantastic, they keep the property in top notch shape and have invested in many improvements through the years. The icing on the cake is the view. No better place to the sunset on Cape Cod. We loved our stay at this waterfront home. It was even more beautiful than advertised. The home was large enough for our 7 family members, and all beds were very comfy. All amenities needed were in the home. We especially loved the outdoor pavilion, and new outdoor patio. The pavilion was actually like another room. (It had great furniture- 2 reclining chairs and a love-seat.) The patio had a grill, a fire-pit, and 6 comfortable sling-back adirondack chairs. We looked forward to relaxing outdoors every night, and watching the beautiful sunset. We loved every minute of our stay in Barnstable. (The property was extremely clean, well-mained, and included all amenities needed. The owner also got right back to me with any questions.) I will certainly tell friends about this great vacation home. Just minutes from historic Barnstable village - known for great restaurants, art galleries, excellent antiquing, and a fun whale watching excursion. For just a little more action, downtown Hyannis is 10 minutes away. Great shopping, a fun bar scene, mini-golf, movies and ferries to Martha's Vineyard and Nantucket. Hyannis Golf Club, an excellent public course, is also minutes away.